Copper Fiddle Distillery in a 2,100-square-foot storefront on Route 22, just east of Rand Road. Copper Fiddle is expected to become the 11th or so small-scale distillery in Illinois. But Copper Fiddle is in a holding pattern in seeking approval for its labels from the U.S. Treasury Department's Alcohol and Tobacco Tax and Trade Bureau due to the government shutdown that started Oct. 8. Watching furloughed federal workers starve because of the government shutdown is one thing. But depriving people of their distilled spirits is another thing entirely. Operatives are understandably outraged. Furloughed Federal workers (and those jobless because of the recession) may contact Roskam's congressional office about the availability of any leftover food. The event will start with an hour of hors d'oeuvres and the first scotch. A second flight of scotch will accompany a surf and turf dinner, and a third flight will be served with dessert. The last time your LakeCountyEye attempted a third flight with a bottle of scotch, boy were your LakeCountyEye's arms tired. 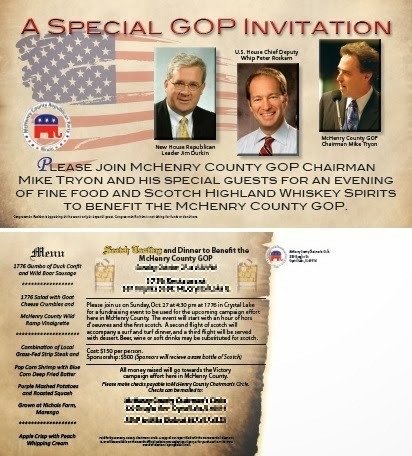 All kidding aside, it seems that shutting down the government and closing the distilleries may be a very clever way to get people to attend a fundraiser! McHenry County is a long hike from Peter Roskam's home turf in Wheaton. Your LakeCountyEye should remind the congressman, and operatives, about the importance of appointing a designated driver.